On any construction site, safety is the number one priority. We are not only talking about the safety of workers here, we include the well being of any pedestrians or motorists that happen to be on or around the site as well. While lighting towers are useful all throughout the year, their need rises in winter months, when the days are shorter and the sun doesn’t provide sufficient natural light. Many construction sites also become more active at night as a convenience to motorists and other daily activities. In these instances lighting towers are particularly important as workers need an illuminated environment in order to continue their work safely. Below you will find 4 of the most important things to look out for when it comes to selecting quality lighting towers on construction sites. The purpose of lighting towers are to provide an additional source of light, so obviously their illumination capacity will be a key consideration. It’s also very important to position and adjust the lights correctly in order to avoid blinding workers or creating a glare which can be a hazard for nearby motorists. Some construction sites are incredibly remote, just think about mine sites or rural development areas, or in locations where lighting may be required in hard to reach locations, such as an underground mine shaft. It is highly beneficial that lighting towers have their own integrated generators with a large fuel capacity. This ensures that power outages or any acts of nature do not affect the safety of the work site. While manufactures will have a range of fixed lighting towers available, the majority of industries that use lighting towers will benefit from them being portable, simply because they can be deployed and moved around various locations. As lighting towers are used in such a wide range of locations, it is important to consider how they can be manoeuvred, whether towed by itself or added to a trailer. It is also important to have an adjustable lighting tower, one which can be extended to appropriate heights needed to illuminate a site sufficiently. Lighting towers will be used in rugged conditions, from construction intensive work sites to weather extreme areas. When considering a lighting tower provider, the durability of the product should be examined to determine its suitability for the project. 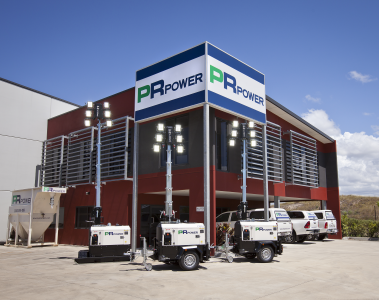 PR Power has a range of fixed and portable lighting towers available for sale or for long or short term hire, depending on the project requirements. Click here to see the selection of lighting towers available Australia wide, or feel free to contact us on 1300 399 499 for more information.